I played for a wedding this past Saturday. It was a very pleasant experience all round. The weather has finally cooled a little, and on Saturday it was in the mid 80s Fahrenheit, with a gentle breeze. The wedding was in the couple’s back garden at the foot of some mountains in northern Utah. After the ceremony I was asked to pipe for the guests for about half an hour, so I stood under an apricot tree and played. About five minutes into my set, the groom emerged from the house with a small silver dish. It turned out to be a quaich, a two-handled drinking vessel. The quaich is filled with scotch whisky and it is customary to offer the quaich to the piper. The piper is supposed to drink the contents in one draught and then turn the quaich over and kiss the bottom. Fortunately for me, I know about this custom and knew what to do. Fortunately for the groom, he had hired one of the few non-Mormon pipers around here to play for him. Since members of the Mormon church eschew alcohol, his offer could not have been accepted by most. I drank the whisky (it was an excellent single malt, by the way) and finished my set. Maybe it was the scotch, or just the glorious day, but I thought I sounded pretty good last Saturday. A couple of nights ago I played an interesting gig. I was contacted by a man who wanted to surprise his wife with some piping on their 15th wedding anniversary. We made the arrangements and I showed up at the appointed hour, expecting to find a party in full swing and a crowd of people waiting hear me play. I was surprised to discover that there was no party as such. My audience consisted of just the man, his wife and their two daughters. They appeared to have just finished dinner, and were sitting in their living room waiting for the performance to begin. Now, I’m used to playing in front of big crowds, but this was the first time I’d ever played for such a small group. I quickly re-tooled the performance I was planning to give, and the gig became a musical lecture on bagpipes, piping, and Scottish history. The family listened attentively while I introduced tunes, played on the Great Highland Bagpipes and Scottish Smallpipes, and demonstrated how the instruments worked. They seemed really happy with the performance. I even played part of a piobaireachd, Scarce of Fishing, since I never pass up an opportunity to expose the public to ceol mor! They really enjoyed it and said they could hear how different it was from the other pipe music I played for them. I left thinking what a nice gift the husband had given his wife and family. I could handle a few more gigs like that! The Celtic Spirit Pipe Band, of Buffalo, NY got a cool gig at the beginning of the month. Apparently, when Rod Stewart comes to town, he likes to have a local pipe band open his concerts. This time it was my old band that got the nod. According to my ex-Pipe Major, Joe Baschnagel, it was a great evening. Playing in front of 20,000 people an a circular stage is not to be missed! A few days later Celtic Spirit headlined another concert with a popular Buffalo Irish Step dance company, Rince Na Tiarna. In a curious confluence, I learned a couple of days ago that the concert was arranged and promoted by a former colleague of my wife. More evidence of the smalltown-ness of Buffalo, I suppose. It took me three missed meetings, but I finally got there. A great evening of Ceol Mor, although I was puzzled it was attended only by members of my band. Turns out the other two bands locally have their practice on the UPS meeting night. I will have to see if we can change the night, so the others can be there. I got a call to play a funeral in the Salt Lake City Cemetery. It’s a beautiful location, with a lot of historically significant people buried there, including Brigham Young, who is kind of a popular guy around here. Last night my family and I went to give some support to our local democratic senatorial candidate, Pete Ashdown. This week he is organizing a series of “honk and waves” at busy intersections in Salt Lake. At last night’s honk and wave, it being Halloween, he suggested people come in costume. 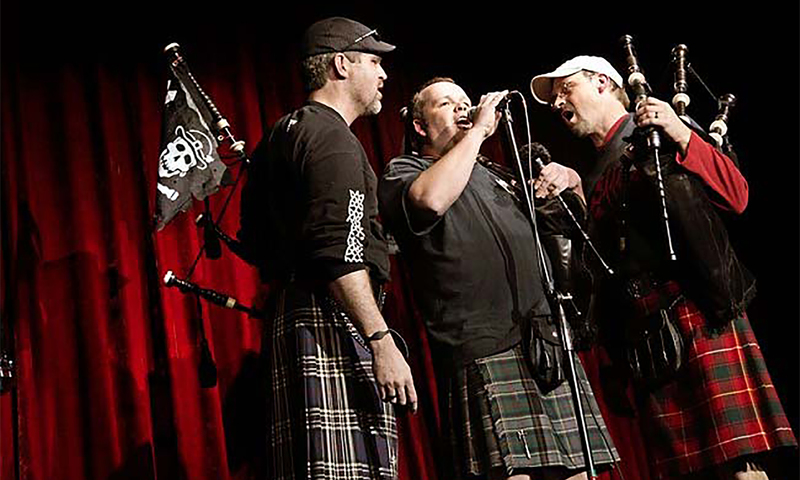 I figured if I was going to dress up, I could put on my kilt and bring my pipes to entertain the wavers and the honkers. In this Drive-by piping I would let others do the driving. Actually, it was quite interesting. I figure if I’m going to make a go of piping for money, I need to be able to play outside and in all weather. The pipes stayed pretty much in tune, as long as I kept playing. I noticed the pitch sagged if I took a break between tunes of more than a couple of minutes. I also discovered that my birl finger went completely numb, as did my left thumb. Still, I was able to hit the main melody notes, and doublings, throws and grips seemed mostly unaffected. Finally, I dicovered that playing the pipes blocks out the sound of car horns. Although Pete Ashdown and the wavers kept waving, I could no longer hear the honks they were responding to. That piece of information is probably not a big concern at funerals, but you never know. Playing for the seniors went really well. I played three sets, took a break to take questions and then played a couple more sets – one on the smallpipes. I saw one guy step out of the room crying, which is normal for that kind of crowd. Older men particularly seem to get emotional at the sound of the pipes. Later that evening, I was at a local park with the kids. I was still bekilt and my pipes were in the trunk. I figured I may as well take advantage of the situation, so I played the sun down for half an hour or so. A family stopped to listen. When I was done a small girl came up to me, pressed 20 cents into my hand and ran off. Maybe I should check into busking licences. Tomorrow I am scheduled for a senior moment. Back in July I was a prize in a drawing at a family reunion. Actually, my piping was the prize, but you get the idea. So, the family member who won me (my piping) is redeeming her prize tomorrow. She coordinates a monthly activity for a group of seniors in her town and tomorrow they get to experience a Drive-by Piping. This will be a senior-speed Drive-by, so it will last a little longer than usual. I am to play, talk a little and then play again. It’s all part of a hectic day for me (four activities back to back). When I play solo I wear the Macfie tartan. I am a Macfie. Although I inherited my Finnish surname from my father’s family, my mother’s family is all scottish and the Macfies of Colonsay were her father’s ancestors. The Macfies (or MacPhies and other variant spellings) lived on the Island of Colonsay until the early 17th century. After they were ejected from the island (following dark deeds and collusion with the pro-English King of Scotland by a so-called friend of the clan) the clan dispersed all over Scotland and many emigrated. There are now Macfies all over the World. So now I am on a mission to find Macfie tunes and connections in piping. There is a piobaireachd called The Rout of the Macphees. I have a recording of Donald MacLeod playing it on the practice chanter. There is a 6/8 march called Donald Macphee’s March. Donald Macphee himself (prominent piper – mid 19th century) compiled a collection of tunes. Not sure if any are actually written by him. So, the search goes on. If any Macfies out there read this and can help – Hello, and let me know!